Over the years, I developed a strong dislike for this word… fail. Seems like a simple word. It’s a word that just doesn’t make sense to me. It takes a lot and I mean A LOT to fail. Failing takes much energy and deliberate inattention. Failing comes from a lack of learning or a lack of effort. When I was pursuing my own fertility treatment, I never looked at a treatment cycle as a pass or fail. When my treatments didn’t work, it wasn’t my lack of effort or attention that didn’t work.. it was an organ in my body that wasn’t functioning. I had a number of issues that contributed to my infertility… my commitment to my health, treatment, and body was not any of those contributing factors. 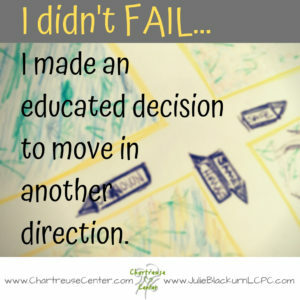 When it was time for my husband and I to move to alternatives in family building, I didn’t view that I personally failed or gave up. My dream was always to be a parent… I was still on that path. Unfortunately, I see how “fail” becomes personalized to the point of self criticism, self loathing, and despondence. In fertility terms, a treatment cycle is viewed in terms of BFP “Big Fat Positive” or BFF “Big Fat Fail.” It’s hard enough to cope with a body system that is already not functioning properly, let alone wear a badge that says “fail.” Why do we do that to ourselves? ❤︎ I prefer the words “successful” or “unsuccessful.” These words bring to light the attention, focus and effort put forth regardless of the outcome. ❤︎ I see women and couples that do all sorts of things to contribute to their fertility success that ends up helping their health in all sorts of ways. ❤︎ I see the success in so many ways… new information, changes in treatment approaches and movement in new directions. ❤︎ I see healthy life changes, improved nutrition, and addition of complimentary therapies like massage, yoga or acupuncture. Yes, it’s your body that is under scrutiny. However, you did all you could to contribute to a positive end result. So, I’m confused… how did YOU fail? I think my relationship with the word “fail” comes from an important time in my life. I was not a straight A student in school. It wasn’t due to a lack of effort, I just needed to explore my actual learning style. Traditional learning was not the best fit for me. Our family valued dinner time together. It was at this time, my parents would inquire about all the different things we learned at school. My brother and sister would report their great test scores… I would have to report my less than perfect scores… Now, don’t misunderstand. I was in some honors courses and I just got average grades… Clearly, it was known I could learn, I just struggled on tests. Anyway, it was during this time I was taught the best question that is critical in my life today. I could share so much information about what I knew about a topic for my family at dinner time. I could participate in discussion in class. I just struggled with the exams. This acceptance from my family helped me to pursue further education and keep sight of the fact that I have something to contribute. Today, this simple question helps to put life into perspective. Life isn’t always easy. I have much to learn from those challenges. 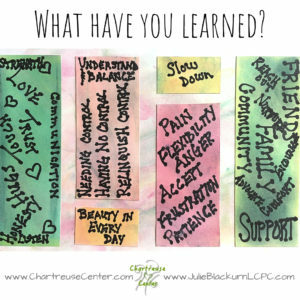 What did I learn? A ton! ❤︎ I learned that I’m not a great responder to fertility medications due to endometriosis. ❤︎ I learned that I have huge emotional variances due to the same fertility medications. ❤︎ I learned I have a very loving husband, more loving than I ever knew. ❤︎ I learned that I have limits for what I am willing to put my own body through in order to conceive. ❤︎ I learned that my capacity to love is far greater than I ever thought. ❤︎ I learned that I didn’t just want to adopt, I wanted to be a safe haven for children in my own community. ❤︎ I learned that I could be happy for a family that reunited after a foster placement. ❤︎ I learned that my compassion for a family that could not reunite would lead to further love that I never would have imagined. ❤︎ I also learned that my wellbeing is very important and I need to take care of myself. I cannot say these are my only learnings… not by far. And I’m still learning. If you are struggling with this concept, a skilled counselor that understand fertility and infertility issues can be helpful. If you are looking for some positivity or thoughtfulness to help surrounding fertility issues, please sign up for emails that include positive statements, unique video links and other useful information. Sign up here. Visit www.ChartreuseCenter.com for information about specialized services for fertility and infertility concerns. ← Get a little positive today!